Landscape design by Michael Brown for a brick bank meeting curved steps, on the Brunel Estate in Westbourne Park, West London (image, Colin Moore). Many thanks to Colin Moore for remembering Michael Brown’s work in a Merl blog post. Michael Brown’s office (in which Colin worked) produced the best UK housing landscape designs of the 1960s and 70s. The outdoor space was very well conceived, well designed, well built and well planted. The office was a hive of activity and remarkably prolific. But the trail Brown blazed led to almost nowhere. ‘Council housing’ fell out of fashion (for both good and bad). It was replaced by ‘social housing’ which mostly lacked the idealism that underpinned Michael’s work. Too-often it is led by developers instead of designers. Another part of the reason for the switch was that so many other ‘housing estates’ were really bad. Their layout was driven by highway engineers, supported by planners, with far too much space allocated to roads and car parking. Most architects proved themselves totally inept at site planning, as Milton Keynes proved. Since site planning was not part of architectural education, and still isn’t, this is forgivable. Another problem was that local authority housing management departments were often bad managers. This is not forgivable. Michael Brown was guided by the principle that housing layout should start from the creation of good outdoor space. 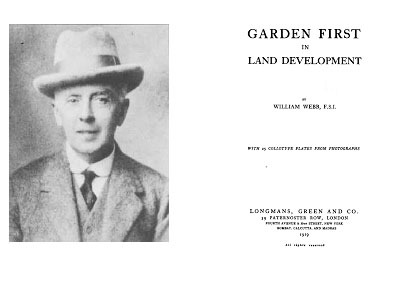 A related principle was encapsulated in the title of a 1920 book by William Webb: Garden First in Land Development. Site planning for housing should begin with the layout of the best possible outdoor space. Dwellings can then be arranged to create and define the space. This is how the squares of Georgian London were planned. Today’s version of Webb’s principle is: LANDSCAPE FIRST IN LAND DEVELOPMENT.